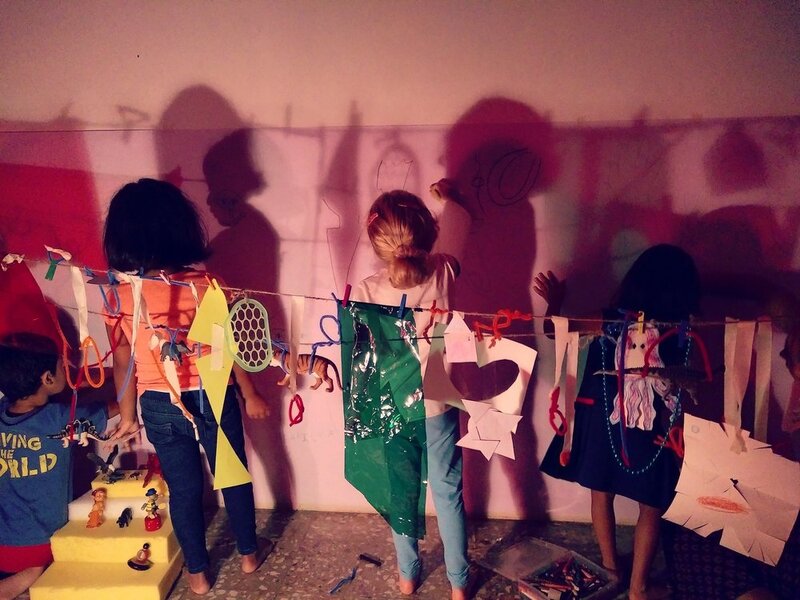 For this month's #LookoutFor, we spoke to Niyati Upadhya about Drawing Room, an initiative that takes her to various cities across India, to do what she enjoys the most—teach art to little kids. Niyati moved to Mumbai from Bengaluru at 17, to learn music under her grandparents. But life had other plans for her, and she soon found herself studying fine art at Mumbai's Rachana Sansad. While there, she specialised in sculptures. 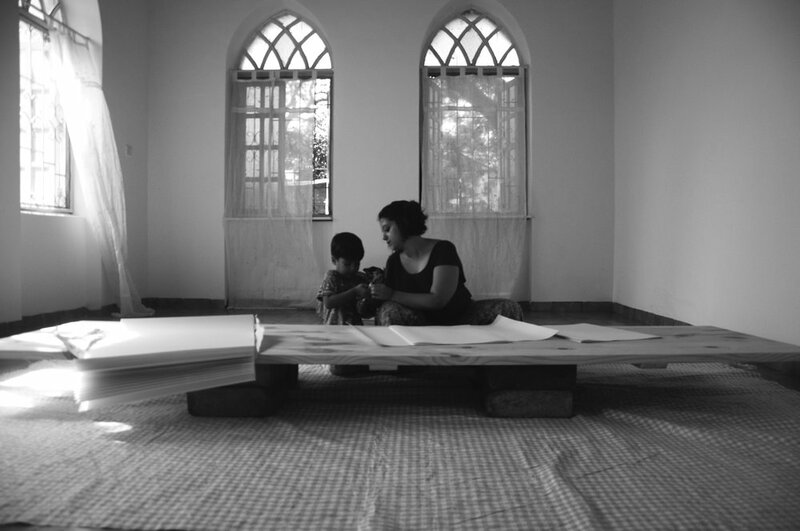 After living in Mumbai for a decade, experimenting with her personal practice even as she worked in the art circles in various capacities, she recently moved back home to Bengaluru. TLJ: Tell us about Drawing Room. How did it start and why did you start it? NU: Drawing Room started in a very nascent form last year when I began conducting a Saturday morning art club of sorts for children. I operated out of the What About Art (WAA) residency space in Mumbai, where I was also working as a programs manager at the time. The experience of working and interacting with some very inspiring and fantastic artists made me realize how important it is for kids to use and add to the energy of an artist's studio. Thinking back to my own years in school, and my early interest in art, I remembered how intimidating and off-putting a structured classroom set-up made me feel, so I realized if my goal was to help children begin to engage, react and respond to the visual form freely and fearlessly, it was essential to break away from the rules and the pressure to create “pretty” things. What started as a simple Saturday morning art session and grew into a very vibrant gathering of children. Personally, it gave me a new avenue — teaching — to bring my ideas together. TLJ: What do you want to achieve through Drawing Room? NU: As a facilitator, (I realised) there were so many wonderful connections to be made between formal art education— such as learning perspectives, colour theory, colouring inside the lines— and simple learning (that can happen) through the perspective of each child’s imagination. By allowing children to explore their own memories and ideas that they wanted to bring to life, I found a method that balanced the two. At the end of the year, we had together created a formidable body of work, which we then exhibited at the WAA. It was titled 'Dear Imagination' for and by the kids. This also made me feel like there was a shift in the way I interacted with my own studio practice, (especially in) the unpacking of concepts and (of) one's imagination. In the twelve months that I interacted with this group of children, it became clear to me that creating an environment that celebrates each child’s unique consciousness was the best way to educate myself about what art education really means to me, and where I want to go with this. TLJ: What is a typical session at the Drawing Room like? NU: Drawing Room’s sessions are built around modules that are inspired by conversations I’ve had over the years with other artist friends...pieces of writing, and sometimes even some odd object I might have seen at a market. I weave many ideas together, like I would if I were conceptualizing a body of work in my studio. A lot of the outcome is left to chance— working with kids can be so transforming, that an idea I set out with, could change shape and meaning through the time spent in the sessions. Some of the most powerful and creative work that's come from the kids at Drawing Room has happened when I planted a question in their minds and allowed them to go wild coming up with the answers. TLJ: Where are you right now? NU: I am in Goa. I have been here for the last 3 weeks, with more to go. Here, I have been teaching a group of toddlers and children between the age of 5 to 10 at a month-long workshop session. It has been the most memorable experience for me thus far. This has been the first time I have worked to build a workshop and curate a dedicated space conducive to the sessions. TLJ: One takeaway from your memories with Drawing Room so far that stands out and only added further resolve to what you’re doing. NU: Aside from the experience as it is, I believe it has transformed my own artistic practice. The give-and-take is extremely enriching for me, personally. Spending time one-on-one time (with children) whether in sessions or in casual conversation (is special since) these interactions have no filters (that adults have) and no barriers. There is no room for doubt in such an interaction, and I’ve found that to be so fascinating. TLJ: You held a class inspired by the French artist Henri Matisse, in Mumbai. It sounds extremely fun. How did the kids take to this artist and were they excited to learn about him? Why did you pick Matisse? NU: Henri Matisse inspired me to understand the difference between a natural form and organic form in nature. Between the ages of 5 to 10, kids are exploring these in every way, by translating things that they are seeing and expressing around them on a day-to-day basis. Over 2 days I shared images and videos and played a game with the kids that visually helped them distinguish between various styles. We then got into specific techniques characteristic of Matisse’s practice. This included body-trace drawings and paintings with contrasting colours. I even referenced figure-painting from Matisse’s early years, and we concluded by creating a composition of cutouts with shapes. The kids really related to the playful quality in his work and had an exciting time exploring the same at the session. I especially observed the rapt attention with which they absorbed the AV I had created, which spanned the life and work of Henri Matisse, and watched them get excited by his fascination for animals, his unique work style as well as playful approach to life and art. TLJ: As for your art practice— we especially love your Bodies in Sect series and the Cult of the Street series. Can you tell us a little about this? What inspired it, how long, and what kind you’re engagement with these is. NU: Cult of the Street is a compilation of two bodies of work that traces the lives of two of Mumbai's most queer professions— the bone setters and the barbers. The exhibit takes viewers though my curated documentation of the city’s streets, which showcases the nature, dynamics and reactions of the people and their business, with the common man. It's set in the by-lanes of Mumbai city and a few other cities.. The Bodies in Sect series was a project I worked on many months later, after drawing anatomy of the human body and plant and insect bodies this was an illustrative series. TLJ: Our theme for this month is ‘cities’. Given how you travel to various cities to conduct your workshops, do you have any one specific learning from each city you’ve gone to for Drawing Room? NU: Children are like sponges. I see through them all that their surroundings are showing them and this adds a layer to each of my travels. The language, the things they enjoy about the city the things they don’t, all of it gives me insights into how children perceive their cities, their surroundings, the energies and cultures that surround them. In quite a few of sessions, we have discussed a city's environment, landscapes and the changes that the children grow through. The children have come up with fabulous illustrations for these and for an adult, it’s like looking at these situations afresh, through new eyes. TLJ: Do you have a favourite Indian city— to make art, to get ideas and to be inspired, or maybe one that’s in itself full of art that you’d recommend a lay-person to visit, so that they may stumble on art more? NU: I have lived in Mumbai for 10 years— through my years as an art student and after. Mumbai as a city, if you allow it, can swallow you up and still be extremely inspiring. My experience of living here made me feel like it churns things up inside of me, making me want to visually tell stories. Some of this took form in my work like Cult of the Street. However I do feel many cities in the South of India are truly inspiring in a mythical, magical way. Like Hampi, for example. TLJ: Any Indian artist you plan on picking for one such class? NU: I was totally intrigued and excited to be at Dhruvi Acharya's solo show After the Fall in October, 2016. It was a largely monochromatic installation in what was a bedroom setting. Viewers would be surrounded by a white, dreamy texture, floaty and almost confusing, with drawings all around. This was a work that really had an impact on me. A few days later, I spoke to the children about the show describing to them all that I saw and we made a class visit to see the solo show. This was a first visit to a formal gallery for many from the class and they really enjoyed the interaction. I wish to integrate more collaborative projects that can take the children to visit studios of practicing artists. This is where they will get to witness the process of many elements coming together. TLJ: Tell us three artists who's work you draw inspiration from? TLJ: Are there any up-and-coming contemporary artists that you’d like to collaborate with, for Drawing Room? NU: Since I started Drawing Room out of WAA residency, I had the chance to collaborate with artist friends— Sarah Pupo from Canada (Happy Accident) and Mahana Delacour from Paris (Colour, light and shadow party). In this respect I’m grateful to the universe for introducing me to many fantastic artists who have influenced my practice in many ways and continue to do so, even from far away. I wish to (also) collaborate with Jim Holyok, Montréal-based drawer and writer. You can read more about the Drawing Room and follow the events here.